Final year of high school has recently begun for me, and at my raw stages of realisation and stress build-up, I can confirm that I am afraid of the unpredictable year ahead of me. I will be obliged to replace old habits like YouTubing, leisure reading and even blogging with STUDYING and I am afraid. To give up the things I love and devote 100% to my school work and studies scare me as I tend to procrastinate tasks that don't bring me immediate joy. 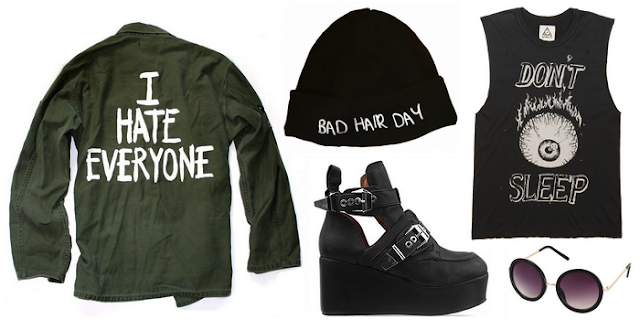 In the meanwhile, here is an angsty outfit wish list that encapsulates my current style, thoughts and emotions. Hehe, I totally hear ya. I was feeling the same way at the beginning of my study years, but in time everything works out. You still have enough time to do the stuff you love, so don't you worry :). don't forget to keep on fighting! I love this post! I might just have to buy myself that beanie, I think I'd have to wear it constantly with my hair aha! I HATE EVERYONE, that would be so perfect for me cause I really do. I just finished my HSC last year, and honestly, it's not as scary as your teachers make it out to be. You honestly do not need to dedicate 100% of your time to school, life is a balance. Your happiness is more important than a number you receive at the end of secondary study. Hopefully you can find a happy balance between studying and having fun! :) Don't worry, I'm sure you will. I love the outfit you put together! I would definitely wear it! And let me tell you, those habits die hard. You don't have to stop them, you just have to manage them. Senior year was not bad at all, in fact I wanted it to go by faster. College is awesome! WAAAAY better than high school!